It is a cold hard fact that even if the entire electrical grid output was used for weather modification, there would be insufficient power available to do much of anything. The distances are too wide, volumes too huge, and locations in relation to a transmitter seldom ideal. Yet weather modification is a reality. How? This article explains how it can be done, from a scientific perspective. Most everyone has heard that silicon is a semiconductor. A semiconductor only permits current flow when the conditions are correct. In a typical silicon semiconductor, it's current flow characteristics are determined by the addition of doping agents - these are mixed with the silicon and become part of it's molecular matrix during the manufacturing process. The two most common doping agents are arsenic and boron. Doping agents cause the silicon to have an excess number of electrons in the P doped regions, and a deficiency of electrons in the N doped regions. A small electronic charge applied to the junction between the N and P regions will cause a cascade effect of a much greater magnitude if a power supply voltage is applied to one side of the piece of silicon, and a load is applied on the other side. That is what makes a transistor, the heart of a basic amplifier. How HAARP works, and a possible real reason why there are "chem trails"
Most people do not realize this, but common air - the air we all breathe, is also a semiconductor, and it can be made to behave just like a piece of silicon if the right doping agents are added to it. If you wish to modify the electrical characteristics of the atmosphere, you need to use an aircraft to disperse the doping agents at a high altitude. If you then take a pair of huge transmitters, such as haarp, and transmit a frequency to a specific region which is timed to phase cancel against the opposing transmitter the frequencies they transmit will vanish and leave a standing DC bias voltage in the atmosphere at the selected region. This voltage is the electrical equivalent of the electronic charge applied between the N and P regions of a silicon transistor. The chem trails are the doping agent, and the ionosphereis the power supply. A flow of current is then is triggered from the ionosphere to the earth below. Because the ionosphere has virtually endless power to give, it is possible to take a transmitter pair with a radiated power of only a couple of billion watts, and use it to trigger a cascade of trillions of watts. That is enough to heat the atmosphere, and trigger a change of climate, storms, ect. It is very important to make sure you do not exceed certain limits, or "clip" the atmosphere, or you will cause a lightning bolt of a sort not ever witnessed. But if kept below certain thresholds, a great amount of atmospheric heating can be caused and no one on the ground would ever notice a thing. This of course would cause very odd electrical readings in the atmosphere. So someone should have been able to detect this, right? Nasa did. They noticed several hurricanes, including Katrina, were not electrically normal. These were the only 3 hurricanes to ever be that way. This could be done using the method mentioned here. 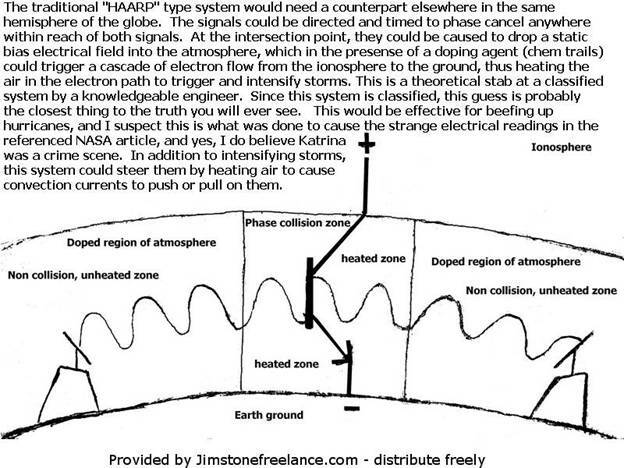 The following image is a drawing of how a Haarp type system could be set up to work. Someone on Godlike Productions opened a thread about a weather anomaly in progress out East. I clicked on the link and my jaw dropped. One thing you cannot see clearly in the animated gif because of camera shake is the fact that the weather system was moving the wrong direction. It should have been proceeding up the Atlantic coast, instead it is heading over the Appalacian range and down into the Ohio valley. If you look at other weather maps from the center of the country, you can see that the storms are following the Mississippi and then hooking left, to follow the Missouri river, and then on up into Alberta. This is not the normal weather flow. The storms along the Mississippi should be pushing across the great lakes on up into Ontario. I am worried that the weather systems causing the flooding may be doing so because of weather modification. Nasa documented that three hurricanes had extremely strange electrical readings, one of which was disastrous. That is empirical proof of weather modification beefing up the hurricanes. I believe what we are witnessing now - the horrible tornados and floods, is also the result of weather modifications. I believe they want to bring untold disaster to this nation, to cause extreme trouble before ushering in an ID system, a new currency, and global governance. And now, one of my own experiences with weather modification. I had a great camera and was able to photograph the line formations in the clouds at night, but cannot find that photo. If I come across it, it will accommodate this little story. In Vancouver BC in the winter of 2007, I personally watched the sky during extremely odd weather at night, and through a hole in the clouds which occurred between violent downpours saw an aurora borealis stepping up and down in discrete steps as if being digitally switched between various intensities. I have spent plenty of time observing real auroras, and this one obviously had a synthetic origin. It was extremely bright, the brightest I have ever seen by far, and auroras do not just step up and down in intensity like that. They fade up and down. I even wondered why it was in such large steps, with modern technologies it would not need to be. Perhaps they don't care about how obvious it is, or perhaps they thought the clouds were solid enough to hide it. I knew when I saw this, in concert with clouds that appeared to be formed along grid lines in symmetrical patterns that the weather in that particular case had to be man made. As usual, if anyone can point out inaccuracies in this article, please e-mail me with recommended changes; Weather modification is so classified that details are sparse and you sometimes just have to guess. I hope I connected a few dots here.